By now you’ve probably heard that the Dell board is supposed to be convening later this month to figure out how it might reorganize itself to deal with the mountain of debt it took on when it bought EMC in 2015 for $67 billion. The rumors began on Friday and involved a couple of possible scenarios including Dell going public or Dell buying the remainder of VMware (which I’m not sure solves the debt problem). Today CNBC reported a third option, that the company could be considering a reverse merger where VMware buys Dell. VMware stock price spiked a bit last week on rumors that Dell would buy them out. For what it’s worth, I contacted Dell on Friday and was told, as you would expect, that Dell doesn’t respond to rumors, but one industry insider I contacted did say, the company is actually considering all options, but hasn’t decided anything yet. The company still reportedly has $46 billion in debt left over from the EMC merger, and as Bloomberg’s Kiel Porter pointed out that amounts to $2 billion in interest payments. Under the new tax law, they will need to pay substantially more because they lose part of the interest write-off. The interest figure looming in the future is probably what is precipitating this discussion by the Dell board now. All of this sounds to me like finding some clever bookkeeping games to shuffle some of that debt around, but Jack Gold, principal at Gold and Associates, said on Twitter, it could be a case of Dell trying to take advantage of the new tax laws, the overheated stock market or some combination of the two. “With the stock market at record levels, and the future not necessarily as bright, it [would be] opportunistic of them to try and cash out a bit before the downturn (which always comes eventually). Tax reform probably also helps with the math,” Gold wrote on Twitter. When the deal closed in 2016, the question was how the company would deal with all of that debt. The thinking at the time was that the company would sell off some of the EMC pieces. It did jettison its own software division in July 2016 for $2 billion to Francisco Partners and Elliott Management. It also got rid of Documentum, the content management company EMC had purchased back in 2003 for $1.7 billion, selling off to rival OpenText for an undisclosed price in January 2017. Surprisingly, it has kept much of the EMC federation intact. One thought at the time was that Dell, which owns an 80 percent stake in VMware, would sell part of those holdings, while still maintaining more than 50 percent of the stock. 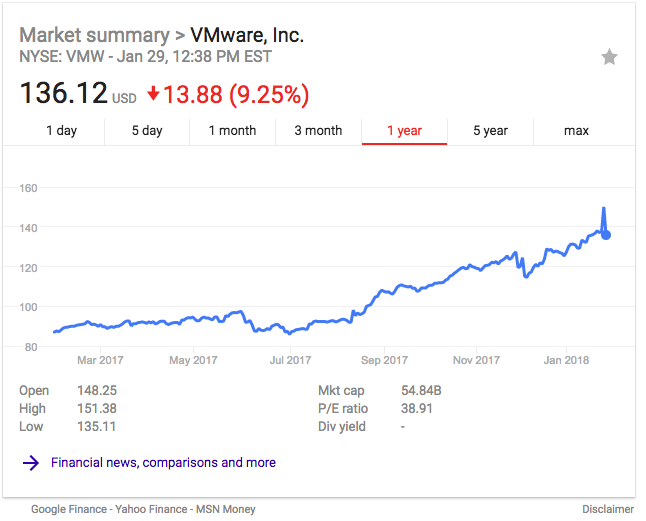 It’s worth noting that VMware is sold on the stock market as an independent company. That never happened and now we find Dell may in fact want to buy out the rest, or have itself swallowed up by VMware, which is a smaller company. The whole thing comes back to why Dell felt compelled to buy EMC in the first place. While some questioned the wisdom of a deal that large, Oracle chairman Larry Ellison called the deal brilliant. His only regret was that his billions were otherwise occupied with his company’s transition to the cloud. Those data centers do tend to be costly. It’s important to temper all of this because these are just rumors right now. Dell may in the end decide to stand pat, but Michael Dell and his financial backers at Silver Lake Partners have shown that they are not afraid of making bold moves. The debt could be the impetus for making such a move. So don’t be surprised if the company ends up executing on one of these options, or something else that hasn’t reached the rumor mill yet.